“Seize for God the Energies of Love” | Walk with us! 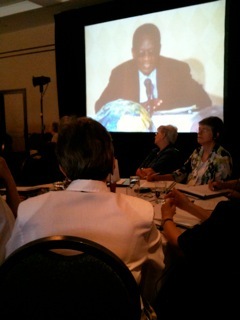 I returned this weekend from the Canadian Religious Conference Assembly held in Montreal from May 27-31, 2010. This year’s theme: “Seize for God the Energies of Love: choose to live the vowed life.” While here in the States we have separate conferences for men and women religious, Canada, like many other countries, has one conference representing both men and women religious. And as in most countries the women outnumber the men by a considerable number. Thus the vast majority of attendees to this year’s conference were women religious. It would be interesting to know what the ratio of women to men is but from my observations it would be similar to when CMSM and LCWR hold a joint assembly as they did two years ago. As president of CMSM I was a guest of the conference along with my counterpart from LCWR and CLAR. It was a good opportunity for each of us to rub shoulders with religious in Canada who face many of the same issues we do in the States. One of the major differences that is readily apparent is the bilingual nature of the conference and Canadian life. Everything was conducted in two languages with simultaneous translation provided. French-speaking religious far outnumber their English speaking counterparts. This should not come as as surprise with the historical Catholic presence in Quebec. There is a real effort made to give due time to each language. A good example of that is the two keynote speakers. The first, Fr. Sidbe Sempore, a Dominican from Africa, spoke in French. While Sister Elaine Prevallet, a Sister of Loretto from Kentucky, spoke in English. Fr. Sempore’s theme was: In a Multidimensional Africa, Giving One’s Life out of Love. My years of service on the general council plus my own trips to South Africa and on one occasion to Mozambique helped me understand the reality Fr. Sempore was trying to describe. So often we think of Africa and in our mind’s eye have equatorial Africa in view. Africa is not a country but a continent filled with many tribes, cultures and languages. It is an area of rapid growth for the Church while at the same time a place where Islam and Christianity often intersect. Religious life, though born in northern Africa centuries ago, has been shaped by Europe. Now that it has returned to Africa finding the balance between Western understanding and African realities is a challenge and at the same time an opportunity. His talk is available on the CRC’s website. Sister Prevallet’s presentation was entitled: Religious Vows: Energies of Life for Life. As the introduction to her talk that is also found on the CRC’s website states: On this second day of the assembly, Sister Elaine Prevallet, SL addressed the vows of consecrated life in a totally new perspective. “The whole earth needs to be included in our understanding of our vows,” she said. “Life is one energy and it expresses itself in us and through us. With all of creation we then form a community of life.” In this way, there are three types of energy at the root of the vows. How, therefore, do we keep these energies free to flow into a life of discipleship? In addition to these two presentations, one of the real values of attending such a conference is the opportunity to meet fellow religious and the opportunity it provides to exchange ideas. We have much in common but we also need to recognize that the Canadian reality is a story all its own. Their history and experiences are unique to Canadian history and circumstances.